Butternut squash soup is one of my favorite soup recipes. This is a recipe I found on the Third Floor Fish Cafe's website. I almost didn't make it this year but I ran across a container of pre-cubed butternut squash at Costco and had to get some. Peeling and cubing the squash is probably the most consuming part of the recipe so finding it already done just made it that much easier to make. 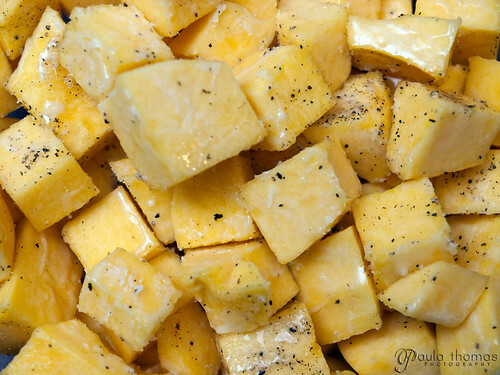 Place the cubed squash in a roasting pan (or a large casserole dish) season with salt and pepper and toss with 1/2 stick of melted butter. Cover the pan with foil and place in a 350 degree oven until the squash is very tender (about one hour), reserve. Melt the other half of the butter in a large saute pan over medium high heat. Add the onions and cook slowly until they are well browned. This will take a considerable amount of time, up to thirty minutes. When the onions have a good brown color, add the garlic and cook for five more minutes. While the onions and squash are cooking, place the thyme and chicken stock in a large pot and bring to a boil. Simmer for five minutes and remove from the heat. Let the stock steep for twenty minutes, and strain out the thyme. To finish the soup, place the squash, onion mix, half of the stock, and the cream in a large pot. 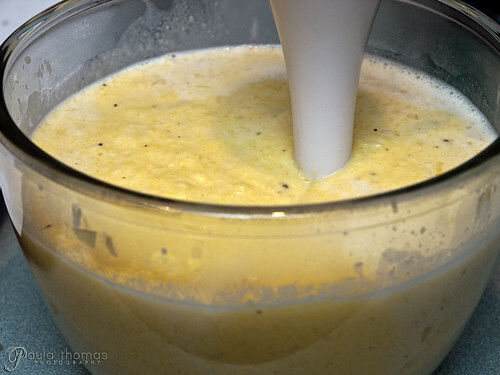 Using an immersion blender, or a whisk, blend the ingeredients, adding the remaining stock to thin as desired. 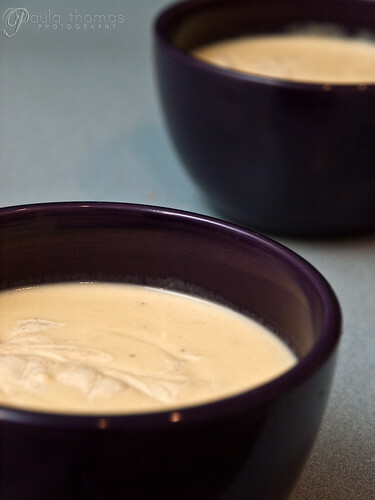 If the soup is still thick you can add water or more cream to thin it some more. Season with salt and pepper, and serve with curry cream on top. Whisk all ingredients together in a bowl and refrigerate until needed.